Dubai is and was always a favourite destinations to travel. It has been converted into city of Skyscrapers with advanced infrastructure & destination for many adventurous activities. It is heard that from 90's, it has been completely converted from desert to recognized cities of the world with several artificial islands and beaches created. Dubai is a part of United Arab Emirates (UAE). United Arab Emirates is divided into seven emirates. Dubai is one of the most populated emirates of UAE. Dirham is the currency of UAE. Hindi, English and Arabic is the common language spoken in UAE. Islam is the religion followed in Dubai but they give importance to other religions also. Indians, Pakistanis & Bangaladeshi's cover substantial expatriate population. Local People are mostly speaking Arabic. Suprisingly Indians are more than Local Emirati. It is heard that if any expatriate has to start his Business, Local Emirati has to be compulsory be made partner in the firm. Moreover no expatriate is given permanent citizenship of UAE, howsoever long he/she has been living into the country. It is a disciplined city where people follow rules strictly and severe penalties are there for the offenders. It is one of the biggest Financial Hub of the World. Trading to several countries is only possible through UAE. All of UAE is rulled as Kingdom. Sheikh Mohammed Bin Rashid Al Maktoum is the Ruler of UAE. Abu Dhabi is biggest part of UAE. It is one of the seven emirates of UAE. It is also city of never seen before Skyscrapers with best infrastructure. Abu Dhabi is rich in minerals and oil. Abu Dhabi has one of the finest hotels of the world. Almost same rules persist in Abu Dhabi as Dubai has. Dubai, Abu Dhabi and Sharjah are famous for their Desert Duning with special Desert Forest Reserves created in their respective areas. Driving is Left hand Drive in entire UAE. It has one of the finest Formula One Race Circuits in the world. Moreover Ferarri, an Automobile gaint has created his first theme park in Abu Dhabi with Fastest Roller Coaster in the World. This time this tour was a organized packaged tour. This was also a family tour with senior citizens so we didn't take any chance other than hiring a tour operator for the tour. Everthing from the hotel to the places to visit with pickup and drop were fixed with its durations. I rather prefer a self organized tour but this time i don't want to take any chance. Moreover i had never experienced a organized Packaged Tour. Our Tour Operator was from our HomeTown. Except Airline tickets we planned everthing with tour operator. We planned our trip in the last week of March after all the exams of the students get over but i recommed best period to travel to Dubai & Abu Dhabi is September to Febuary. It really gets hot after mid-March and before September. It was a complete 7 Day Trip to Dubai but you would find several things left even after that. The package was planned a mixture of busy & free days. Our Stay was at Hotel Grand Excelsior, Bur Dubai. It was located in the midst of the city & near shopping area. It is a 4* Hotel. On 1st Day, we reached Dubai early in the morning at 6.00 am and were picked up by the taxi pre-hired by our tour operator, we reached hotel and relaxed. It was just like free day as we have our schedule for Marina Dhow Cruise at Dubai Marina Bay in the evening. We enjoyed facilities of Hotel with the family and roamed around the hotel to discover nearby places of interest and food junctions. We were picked up from hotel in the evening at 7.00 pm and went straight away to Marina Dhow Cruise Berth at Marina Bay. There are two different places where cruiseliners work. One at Marina Bay and another in the Creek. We opted for Marina Dhow Cruise as it was suggested by many that it is better than Creek Dhow Cruise. We enjoyed a lot viewing several skyscrapers with massive lighting allaround the Bay. It was delightful to view different building with different shapes. Wonderful Engineering was the proper word for this place. We had our dinner on the Cruise with special Tanoura Dance Show. The dance was very special and we enjoyed a lot. The Cruise just covered all the main points of the Bay and returned to the Berth from where it originated. We were dropped at our Hotel. It was relaxing time. On 2nd Day, we have to get ready for Half Day City Tour at 8.00 am. We reached into the corridor of our Hotel at time and were picked up for the Tour. We were taken to Jumeriah Beach where we were given a hour to roam, swim and click snaps with the beach and the long standing costliest Al Arab Hotel which is also an example of marvelous buildings in Dubai directly visible from Beach. The Beach was very clean and maintained. 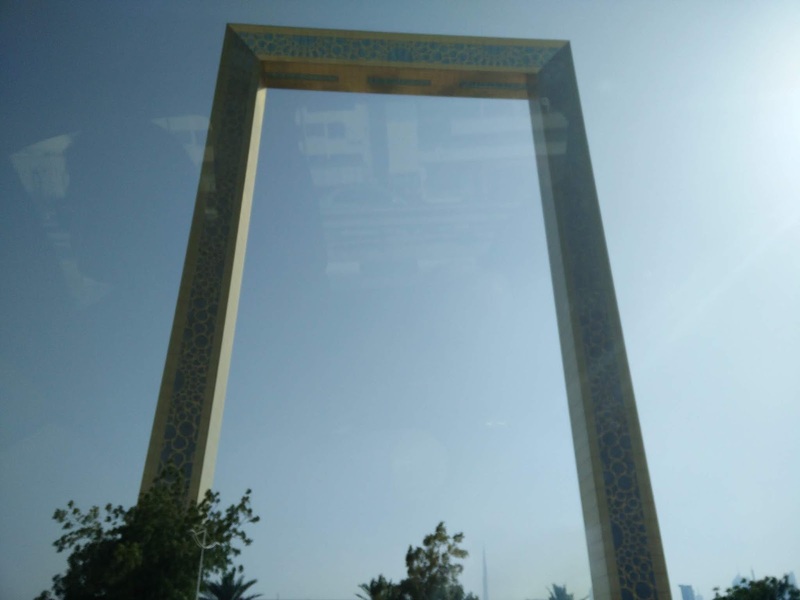 Burj Khalifa, the tallest building in the world and the new Dubai Frame the excellent marvel of architecture and engineering was viewable from all over the Dubai. At the Top of Burj Khalifa was with our itinerary in the evening. Further from the Beach we moved to The Palm Jumeriah Island. We were heading towards the famous Palm Atlantis Hotel. There was a stopover in front of Palm Atlantis, were we took several snaps with the hotel and the finest Beach-Front in front of Palm Atlantis. Palm Jumeriah is basically an artificial island created in palm shape with several hotels, residence of some elite people and some adventurous water parks and amusement parks. Further from the Beach-Front, people are seen doing water-sports. Several Cruiser Yacht is seen from the Beach-Front. Then we were taken to Residence of the Ruller, The Palace of the King which was viewable from outside. We took snaps of the Palace and moved further. The Palace was covered with beautiful gardens and fountains. Finally we were taken to Gold Souk and Spice Souk located in Diera Area of Dubai after crossing the creek. Gold Souk was full of shops with Eye Catching Gold Jewellery. Plenty of Gold with the world's heaviest finger ring is seen in Gold Souk. Just adjoining to it was Spice Souk, where lot of spices were availabe to be seen. Then we went to hotel for taking Lunch and Rest for an hour or two. We have to be ready for Burj Khalifa Trip in the evening by 4.00 pm same day. We were picked up for Burj Khalifa from the hotel in the evening. It was located in the midst of the city. Burj Khalifa covers several attractions at the same place. 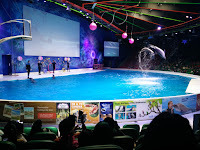 There is a Dubai Mall, Dubai Fountain Show, Burj Khalifa Lightning Show, Dubai Aquarium, Underwater Zoo and several activities all at one place. We first of all took tickets for climbing at the Top of Burj Khalifa from the vouchers provided by our tour operator and obtained time schedule tag. This Time Schedule Tag is the time at which we would get to climb the high speed elevators to get at the Top of the Burj Khalifa. 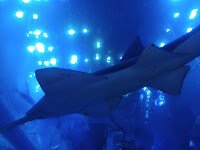 We had sufficient time to cover Dubai Mall and we went to Dubai Aquarium & Underwater Zoo which was also located in Dubai Mall where we viewed several extinct Fishes and animal species under a tunnel which was beneath a water resorviour with several sharks and other fishes. Then we came out of the Dubai Mall to see Burj Khalifa Lightning Show which was one of the world's best and then we viewed Dubai Fountain Show which is happening in the lake. After the Fountain Show we went to the entry point of high speed elevators to climb at the top of the Burj Khalifa. On the way to elevators it was shown that how this marvelous Burj Khalifa came into existence. Elevators were so fast that within few minutes we reached at 124th Floor of Burj Khalifa. Further from 124th Floor we went to 126th Floor with stairs. There was feeling of reaching at the Top of the World. Everything from the Top was like looking Dubai from the Sky. Full of Dubai was sparkling with lights and view of marvelous architecture and infrastructure was enchanting. We took sufficient time at the top and came back at time as our taxi was waiting down. Now it was time for back to hotel and take rest with busy schedule day. On 3rd Day, it was time to visit another emirates of UAE, Abu Dhabi. We were ready to be picked up for further journey at 8.00 am in the morning. We started our journey at 8.15 am for Abu Dhabi which was 1.5 hour from Dubai. As soon as we reached Abu Dhabi, we went to the Grand Mosque. Sheikh Zayed Grand Mosque is the largest mosque in the country. It is an ultimate example of Architecture and excellent interior and carvings. It is also famous to hold world record for largest single piece Carpet in the world. Pillars have been coated with golden finish. It was mind boggling interior. It is compulsory to cover full body for ladies and girls. There is facility for taking Burqa at the entrance. It is essential for all women to wear full dresses as it is Islamic Tradition while visiting mosque. Though non-muslim persons cann't enter the main area of worship but it was overall a good place to visit in Abu Dhabi. After the mosque we went for rides in Ferrari World made by Automobile Company of World's Fastest Cars 'Ferrari'. This is only amusement park of Ferrari in the world. It is adjoining the Formula One Race Track where once in the year car races are held. It is a wonderful place to visit in Abu Dhabi. You would be surprised to know that we took ride of World's Fastest Ride 'Formula Rossa'. It has a speed of 240 Km/h. We also took ride of Flying Aces, which has the tallest loop of 52 Mtr. This ride was amazing with speed of 120 Km/h. I personally found this ride more exciting and dangerous than the fastest ride of the World. This both roller coasters were the best in all over the resort. Though there were many rides to enjoy. You would also found many Ferrari's standing to take photo snaps. You would also get a theatre experience of the history of Ferrari. It was a wonderful day with full of rides and beautiful places. We returned to Dubai in the evening. 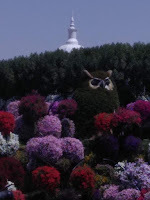 On 4rth Day, we had a relaxing day though there was one attraction to be visited that is the miracle garden. 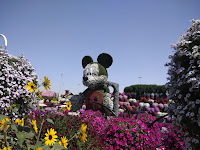 It is one of the finest Gardens in the Dubai and most photogenic place in Dubai. It was surprising that even if Dubai is covered with Desert from all sides and there is no source of fresh water, the garden has Plenty of Plants with different kind of Flowers all over. It is totally a unique experience to view the plants in different kind of shapes like Micky Donald or Owl or Aeroplane etc.... All the plants were covered with different kind of flowers with different colours. There is lake, fountain, sitting places, houses all covered with different kind of flowers. This garden is maintained and open all round the year. It is a must visit place in Dubai. It is adjoining to Global Village, a place for unique kind of shopping from all different countries but we didn't visited the place because of time restraint. Rather we went back to hotel and took lunch and went to Gold Souk and Spice Souk for Shopping. I recommed to purchase Iranian Saffron from Spice Souk which is damn cheap compared to India. A lot of Bargaining can be done, which also depends on quantity required. At last we crossed the Creek just opposite Gold Souk by Boats available there, which took us to Mina Bazar in Bur Dubai nearby to our hotel. It was the cheapest option and less time consuming to reach Bur Dubai from Gold Souk. We enjoyed the boat ride on the Creek. Our 5th Day was reserved for Aqua Venture and Lost Chamber which is located in Palm Jumeriah Island and adjoining to Palm Atlantis. It is actually a property of Palm Atlantis Hotel but entry to them is possible seperately also. Basically the entrance of Lost Chamber and Aqua Venture starts from other part of Palm Atlantis Hotel. With the entrance there are lots of Shops for Shopping and then we reached Lost Chamber. 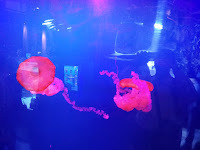 Lost Chamber is another Aquarium on our tour. Different types of fishes and other mammals of sea were seen all over in the Lost Chamber. There was Dolpin Scuba Dive and Shark Safari which we didn't attempted. It's ambience was worth looking. Lost Chamber didn't took too much of time. After that we reached to the entrance of Aqua Venture where we hired Lockers to put our belongings. Aqua Venture is one of the best Water Parks of Asia. One of the major attraction was its 'The Tower of Poseidon' which comes almost vertically from the tower about 12 Storey building straight into pond beneath. Here you find world largest waterslide Aquaconda. Aquaconda is family ride. We enjoyed almost all rides. The Tower of Poseidon was the toughest ride we did. Though there was one toughest ride known as Slitheren which we were unable to attempt due to time constraint. We enjoyed the River which had escalators on several junctions where we were lifted to the top and with the pumped water were thrown on other side with the tube in which we were sitting. River was suitable for all age groups. One other attraction was Splasher Kid's Play Area which was specifically for small kids with entrance to few guardians. That was all for the day. 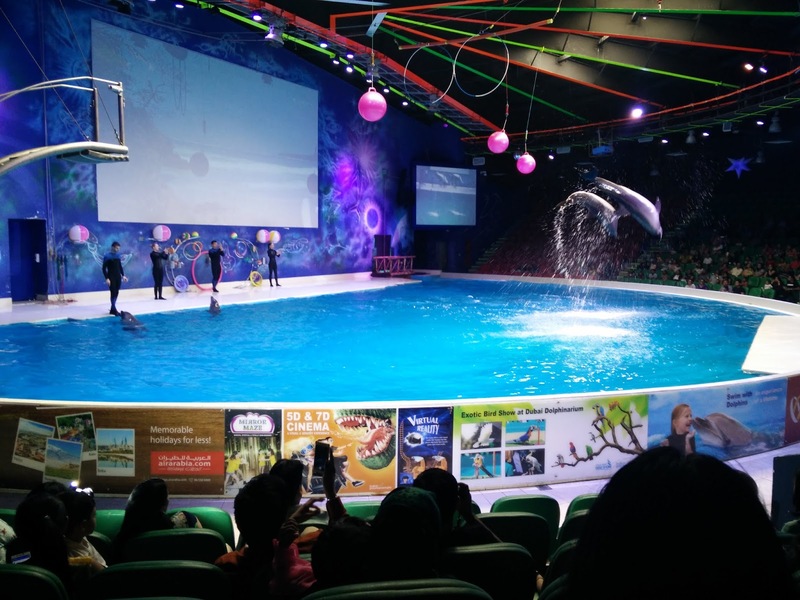 Our 6th Day was special, as in the morning it was Dubai Dolphanarium & Seal Show and in the evening it was Desert Safari. We left our hotel at 10.00 am for Dubai Dolphanarium & Seal Show. There was a bird show also. 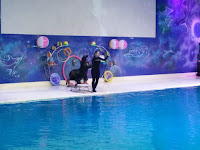 It was a fantastic experience to view Dolphin & Seals doing several tricks in the show. We even participated in the lucky draw & also won the same. It was throwing balls into the pond and three dolphin brings three balls of them who are declared winners. 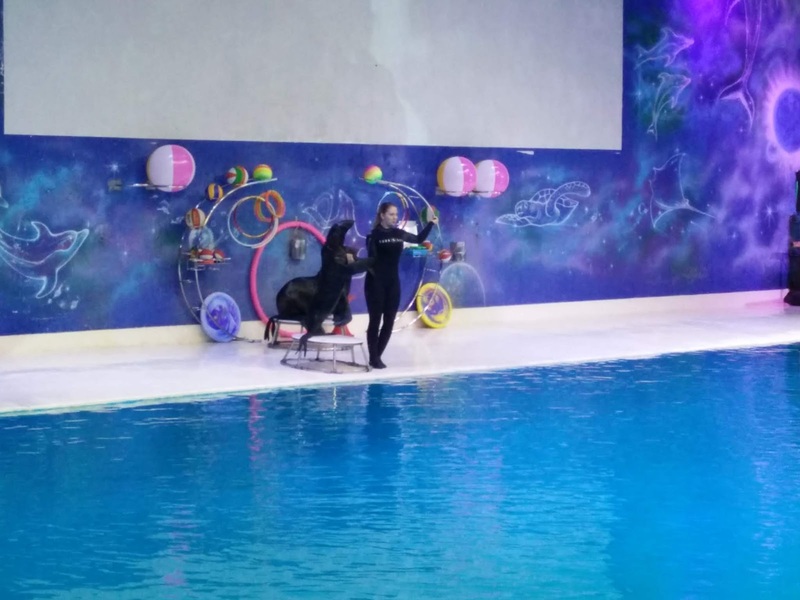 I had seen Dolphin show even before i came to Dubai but this was special. It is must visit in Dubai. We were dropped to hotel after the show. We took lunch and rest to get ready for Desert Sand Dunning. We left the Hotel at 3.00 pm for Desert Safari. This was far away, so it took around 1 Hour to reach the Desert with ample sand mountains. We reached a place where we were shifted to another car (SUV) whose tyre air pressure were very low. We have to reach the base camp of Desert Safari. Before that the driver took the Car into the sand. It was just like the experience of Roller Coaster, the driver took the car up on the sand mountain and just flown the car down with the speed from the sand mountain. This sand dunning was my first experience. After several round of Sand Dunning, we reached to Base Camp of Desert Safari. First thing after reaching to the entry point of Base Camp was Camel Riding. It was free for all. There were ATV rides and other rides also available but all of them were chargeable. Base Camp was entirely made up of Bamboo and Wood. Covered from all the sides with Food Counters and Sitting arrangements for VIP Bookings were made in the covered part of the Base Camp. Then in the corridor in the middle, there was sitting arrangements on the Beds with Pillows and small table and at the centre of all sitting arrangement there was stage. Food in the Base Camp was free other than hard drinks. There was arrangement of taking snaps in the local Emirati Dresses which were freely available with a person helping in dressing. There was a person with Eagle. Those people who want there pictures with the Eagle on their hand and head can take snaps with it. It was also chargeable. Then we took Food and Soft Drink which was free. After taking food there was Belli Dance, Tanoura Show which we also enjoyed in the Marina Dhow Cruise on 1st Day and then finally there was a Fire Show. We loved all the shows. It was fantastic evening that ended our packaged tour apart from dropping us at the airport on the last Day Tommorow. We were dropped at Hotel and took rest from the busy schedule. Finally the 7th and the last Day of our trip to UAE. It was a free Day and we totally utilized the Day with full day spent on shopping for the loved ones waiting for us in our home country. We were picked up in the evening for Airport Transfer. Avoid Travelling in Fly Dubai Airlines as it is overcrowded. Moreover if you have checked-in luggage then ensure that some part of it would be broken. They handle very carelessly. Also on the airport specially for Fly Dubai, even if you reach 3 hours prior to the flight you would not be able to get a single minute of rest. All the 3 hours standing in the line for Boarding Pass and then straight away rushing directly to the flight as the time has lapsed. Avoid getting too close even for snaps in the Grand Mosque in Abu Dhabhi. Also if possible get full covered clothes where no part of the body should be visible other than face and palm. Full Sleeve Dress. Persons with visible injuries (persons wearing casts,bandages, braces etc.) are not permitted. Scarf, what we call in Hindi 'Dupatta' is must and the Dupatta must be long enough to cover the face and whole hair of lady, not like handkerchief. No Transparent, skin tight, deep neck, shorts, leggings, T-Shirt will work. No Dress with Human Face, Animal or Bird Face will allow. They may use a trouser and shirt but full sleeve only and not transparent, deep necked and not too much skin tight. No Shorts, Capris or Similar Dresses allowed. May use half sleeve dress. No Transparent and too much skin tight clothes allowed. No Dress with Human Face, Animal or Bird Face will be allowed. Carry Swimming costumes for any Water Park visited in Dubai or Abu Dhabhi. They charge very much. Also carry Sun-Screen Lotions for avoiding direct sun contact with skin. Also carry Cap or Hat. There are strict laws in Dubai & Abu Dhabhi, so avoid any instances of law breaking. Follow rules and regulations as per instructions. as soon as we receive these information, we would start with the processing of your required amount immediately. © 2018 Vishal Bihani Tripadvisor Logo : © 2018 TripAdvisor . Simple theme. Powered by Blogger.